The English Language Canon Powershot SX230HS owner’s manual / operating instructions (Canon calls it the “PowerShot SX230 HS Camera User Guide”) is now online and available for download at Canon.com (right-click and save the user guide to your hard drive). If the download link for the SX230 HS user manual didn’t work for you, go to the Brochures & Manuals download section for the SX230 HS and manually locate the file PSSX230HS_SX220HS_CUG_EN.pdf. 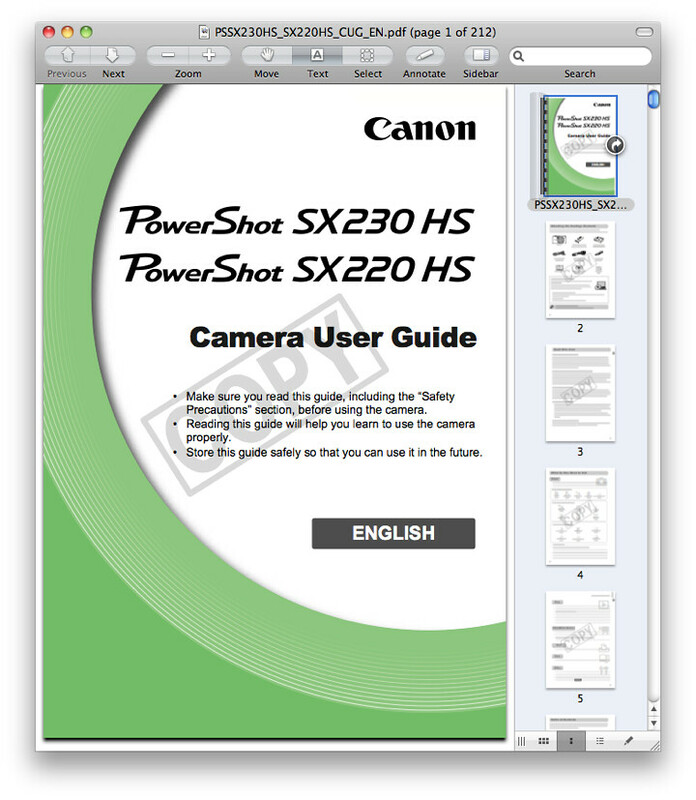 Unlike with Nikon, Canon allows you to freely print the Powershot SX230 HS owner’s handbook without building in any password protection into the PDF. There is a watermark displayed on each page though, and re-saving or copying portions of the manual does require a password. The file size of 212-page Canon SX230 HS Adobe Acrobat PDF document is 12.1 MB (megabytes). The guide discusses the features of the SX230 and how to use the camera. Pages 16 through 18: Proper insertion and removal of SD, SDHC or the latest SDXC memory cards. Pages 133, 134: You’ll need a cable with a HDMI Mini connector on the end that connects to the SX230HS in order to view high-quality images from the camera on HDTV sets. Alternatively, you could purchase the Canon-branded HTC-100 Mini-HDMI cable. The SX230 HS can be controlled with the TV remote when connected to HDTV sets that have HDMI-CEC (CEC stands for Consumer Electronic Control) capability. Page 176: Instructions for using the AC Adapter Kit ACK-DC30 to operate the camera on household electrical power. Pages 177, 178: Complete instructions on using Eye-Fi SD / SDHC memory cards. Popular Canon SX230 HS books and other printed literature and reading material in the Arts & Photography and Books section on Amazon.com. Visit Canon SX230 HS for reviews, tips, tricks, techniques, resources and other helpful information.